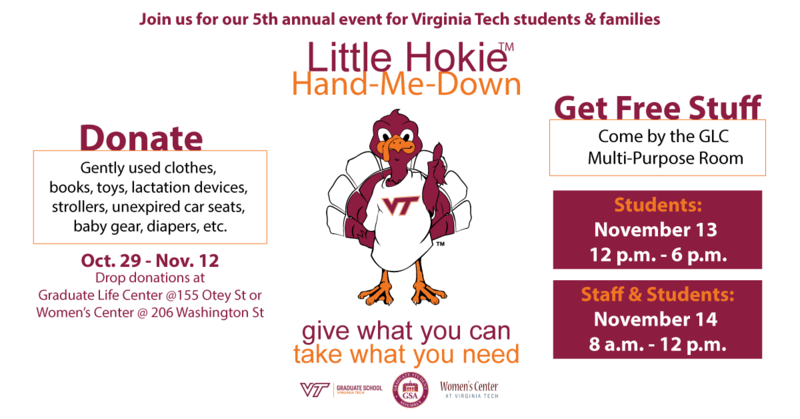 The annual Little Hokie Hand-Me-Down event returns on Nov. 13 and 14 in the multipurpose room of the Graduate Life Center, 155 Otey St. The six-year-old event offers university students and staff members with children the opportunity to “shop” for a wide range of infant and children’s clothes, accessories, and other items they may need, free of charge. The Graduate School, Graduate Student Assembly, and Women’s Center at Virginia Tech sponsor the Hand-Me-Down, and members of the university and Blacksburg communities make the event possible, donating gently used or new items for families. Gently used clothing in baby and young children’s sizes and maternity clothes. Toys and children’s books, including music and DVDs. Unexpired formula; medical supplies, such as breast pumps; other lactation devices. Strollers, unexpired car seats, high chairs. Bathing and grooming supplies, including bathers; unopened and unused creams, lotions, powders. Feeding supplies, such as bibs, baby bottles, food warmers. Baby gear, such as activity gyms, bassinets, play mats, baby carriers, swings. On Nov. 13, from noon until 6 p.m., graduate students are welcome to shop at the Hand-Me-Down. Each shopper receives a bag and can fill it with as many items as they need. They also may choose from a selection of the larger items. Everything is free. University staff members may shop on Nov. 14, 8 a.m.-noon. Any leftover items will be donated to charitable organizations in the area. For more information about the event, please email Jessie Meltsner at jmelts@vt.edu.